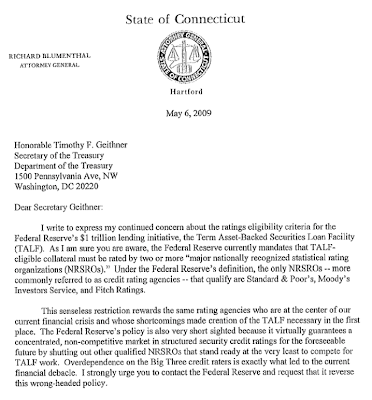 The Fed is “conducting a broad review of our approach to using rating agencies,” Bernanke said in an April 13 letter written in response to a complaint from Blumenthal that the central bank’s rules unfairly favor the companies that helped cause the financial crisis. Here's a screenshot and link to Blumenthal's original letter, cheers to this man! Moving along - Almost 2 years ago, Robert Rodriguez of First Pacific Advisors scared the pants off anyone listening to a lecture of his. I've pasted his associates' questions put to a Fitch official, regarding the models behind Fitch's ratings on Mortgage-Backed Securities. Fitch admits that their models would "start to break down" if home prices flattened out, and if housing prices went DOWN (crazy thought at the time), their model would "break down completely." Incredible. We were on the March 22 call with Fitch regarding the sub-prime securitization market’s difficulties. In their talk, they were highly confident regarding their models and their ratings. My associate asked several questions. “What are the key drivers of your rating model?” They responded, FICO scores and home price appreciation (HPA) of low single digit (LSD) or mid single digit (MSD), as HPA has been for the past 50 years. My associate then asked, “What if HPA was flat for an extended period of time?” They responded that their model would start to break down. He then asked, “What if HPA were to decline 1% to 2% for an extended period of time?” They responded that their models would break down completely. He then asked, “With 2% depreciation, how far up the rating’s scale would it harm?” They responded that it might go as high as the AA or AAA tranches. These agencies are worthless, as are their ratings. 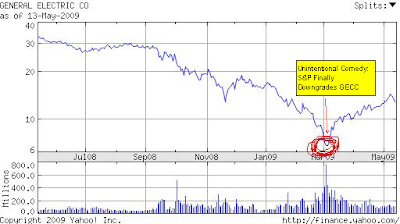 GE is up 52% since the S&P downgrade of GE Capital on March 12th. Magnitudes more important than the ratings agency action was the large insider buys on 3/6 and the pricing of GE Capital notes at attractive terms on 3/9, after which shares have risen 72%. The bond and stock market have such a better read on the company's fortunes that it renders the ratings agencies nearly worthless - yet they benefit from a government-mandated monopoly.